UPDATED: Gov. Greg Abbott, Lt. Gov. Dan Patrick and House Speaker Joe Straus announced late Thursday the terms of a $3.8 billion tax relief package — a move that followed weeks of testy negotiations. Gov. Greg Abbott, Lt. Gov. Dan Patrick and House Speaker Joe Straus announced late Thursday the terms of a $3.8 billion tax relief package — a move that followed weeks of testy negotiations between House and Senate leaders over the terms of the agreement. Both chambers must still sign off on the deal, which calls for a 25 percent reduction to the business margins tax and a $10,000 increase in the homestead exemption starting this year — subject to the passage of a constitutional amendment on the November ballot. 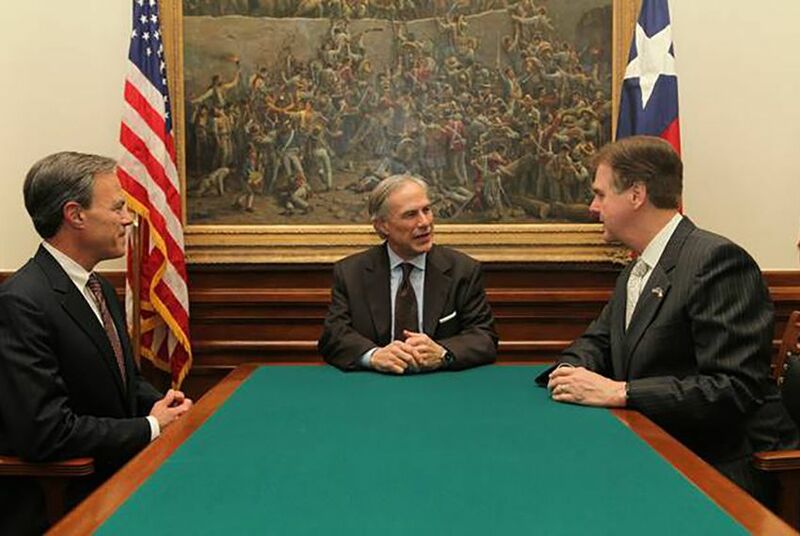 Patrick called it "a major achievement to come to an agreement on such a broad spectrum of significant legislation.” Straus, meanwhile, said the agreement "will allow the House to vote on tax relief that encourages economic growth." The final deal includes property tax relief, as the Senate wanted, along with the version of business tax cuts the House wanted. The House's earlier push for a sales tax cut fell away early in the negotiations. The House Ways and Means Committee approved a property tax cut bill Thursday that appeared to resolve a disagreement between the House and Senate on a compromise tax relief package. Leaders in both chambers had already agreed to ask Texas voters to approve a $10,000 increase in the homestead exemption. They had differed on when to hold the election, and whether the tax relief should be instituted for both years of the biennium or just the second year. The Senate approved a bill that would set the election on Sept. 12 and institute the exemption increase for both years of the biennium. The House favored moving the election to November, when counties already have an election planned, and instituting the tax relief beginning in the second year of the biennium, a move that would cut the cost of the tax relief by about $650 million. House Ways and Means Chairman Dennis Bonnen, R-Angleton, confirmed Thursday that his committee had approved moving the election to November, but still implementing the homestead exemption increase for both years. County officials around the state had complained to lawmakers about the cost of holding a September special election, with some labeling it an "unfunded mandate." However, they had warned that it would be very difficult to update this year's property tax bills in time if the election was pushed back to November. According to the new version of Senate Bill 1 and Senate Joint Resolution 1 approved by the committee, county tax assessors will send out a "provisional" property tax bill before the November election that shows what a homeowner will owe in property taxes if the constitutional amendment passes and if it doesn't.